Is HourBenefit will return the Principal? Is SignUp with HourBenefit free of charge? Yes. SignUp with HourBenefit is completely free of charge. In order to open an account you only need to have an active e-mail address. Switch to SignUp Page and fill in the require fields. It will take less than a minute. We accept Bitcoin, Litcoin, Perfect Money, Payeer, Okpay & BankWire. Your account will be updated as fast as you send a payment. How can I make money with HourBenefit? 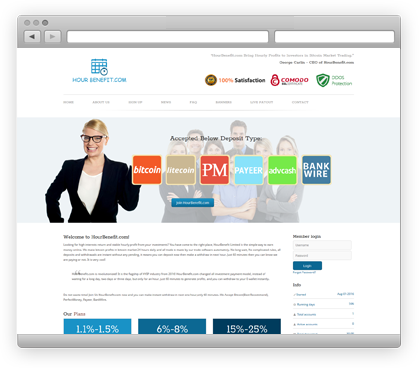 Just register and create one or several deposits within one or several investment plans. After that you will be receiving profits according to the conditions of the investment plan you choose. Can I make a new deposit from my account balance ? No, you need to withdraw firstly. To make a request you need to login to your account and click on "Withdraw " in the right and top menu, then fill in the necessary info to complete your withdrawal request. When will my withdrawal request be processed? All of our withdrawal is instant,including Bitcoin withdrawal. We offer 3-10% referral commission program to our customers. It is a good way to make extra money. By inviting more people to our investment programs, you will instantly receive 3-10% ref commission from every deposit your referrals made. No, recommending yourself is deemed as a kind of cheating and extremely forbidden in our referral program. You will not get any commission or bonus by recommending yourself. Besides, we may suspend all multi accounts. Will I get my referral commission for every deposit my referrals make from external e-currencies or account balance? You will get referral commission for every deposit your referrals make from external e-currencies, but we do not offer referral commission for deposit made from the account balance. Do I need to have active investment in order to participate in your affiliate program? No, It is free to earn from our affiliate program without having to make an investment with our company. You only need to open an account and start to promote our site. Can i make multi deposit in HourBenefit.com?